grow indie | Save the Kales! ‘Tis better to give, yes? The lovely Robyn Jasko, author/gardening extraordinaire, is giving away a bunch of goodies to Save the Kales! readers. 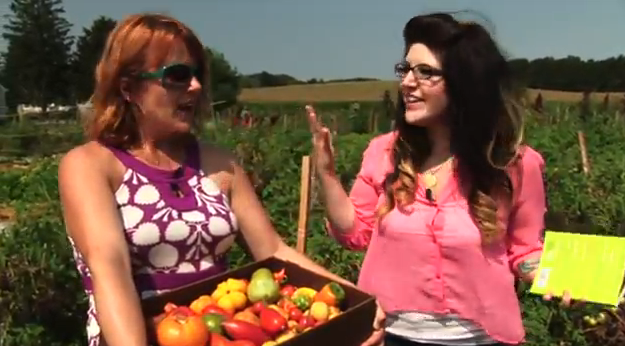 Remember when she showed us around the Grow Indie Garden? Because she’s the sweetest pea in the pod, she’s giving away some books and seeds, and here’s YOUR chance to get them. Cinderella, Dickinson pie pumpkin and Jack O Lanterns for carving). This is an adorable and endlessly informative book. The cheerful illustrations will encourage even those with the reddest of thumbs (those would be the opposite of green thumbs, right? ), and the tips and recipes help you make the most of your personal harvest. Read the glowing reviews! 2. Leave a comment/tweet telling us what plant you’d grow if you could grow ANYTHING, real or imagined. An avocado tree in Pennsylvania? A bush that churns out mugs of hot coffee to folks on the street? It’s nice to daydream about warm tomatoes and plucking peppers by their stems as we creep deeper into these dark, sometimes dismal, winter days. You can learn more about Grow Indie, Homesweet Homegrown and get your entries in! We travel to the Grow Indie test gardens to meet DIy gardener and book author Robyn Jasko. In the kitchen, we make a Stir-fry Shepherds Pie with Wasabi Mashed Potatoes, followed by a breakfast or dessert of a Rice Bowl with Stone Fruits, Ginger and Cinnamon topped with an pretty pistachio garnish. Finally, we meet Lehigh Valley nutrition coach Michelle of The Joyful Elephant, who helps people transition to a plant-based diet. Boil a pot of water on the stove, enough to cover the potatoes, and add salt. Boil until potatoes are soft, about 20-25 minutes. Drain and set aside to cool. Add 1 Tbsp olive oil to a large pan, then add the onions and mushrooms. Let the onions get translucent, about 4 minutes. Stir to avoid the veggies sticking to the bottom. 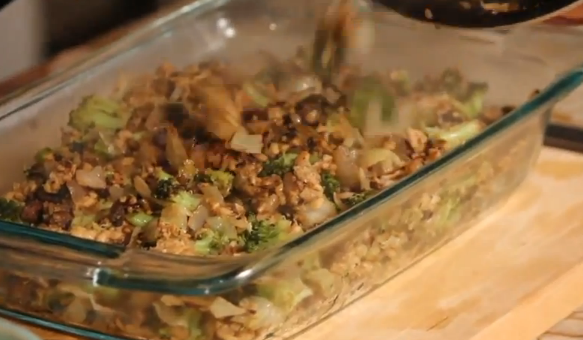 Add the crumbled tempeh to the pan, letting it brown and stirring so it doesn’t burn. If the veggies are sticking to the bottom, add a little soy sauce or Bragg’s to loosen them up. Add the broccoli and cabbage to the pan. Make the dressing (if you haven’t done so) and add that, stirring it through the veggies. Let veggies cook until broccoli is crisp-tender, about 5 minutes. Whisk everything together in a small bowl. Use a potato masher to mash potatoes — or if you have a fancy mixer, use that! When potatoes are mashed, add remaining ingredients. You don’t need to add vegan butter or oil, but you can for a richer flavor. Note: DO NOT EVER “mash” potatoes in a food processor. They get very gummy and are… awful. 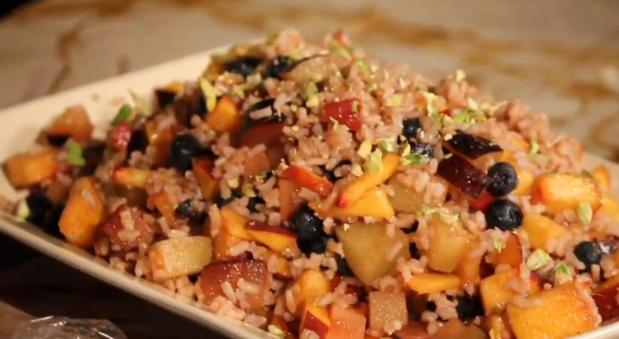 Add rice and fruits to a large bowl and mix. Add dressing and mix with rice and fruit. Get a handful of shelled pistachios, wrap in saran wrap, and use a hammer (or heavy object) to gently crush them into pieces, and use them to garnish the bowls. 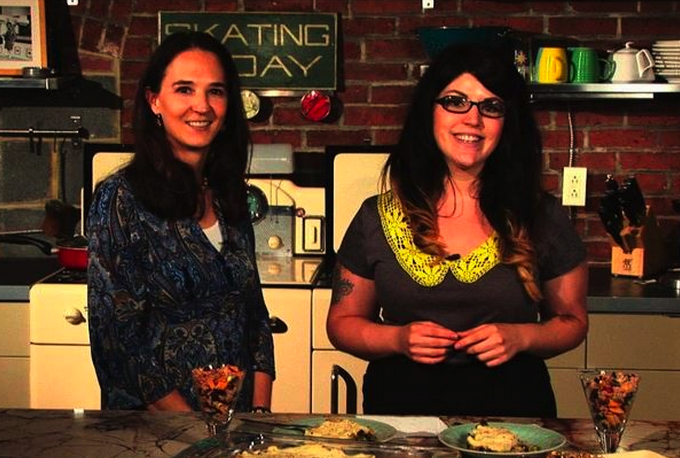 Robyn Jasko of Grow Indie, and Home Sweet Homegrown with Jaime K of Save the Kales! Meet Robyn Jasko, author of Home Sweet Homegrown book and gardener extraordinaire! Robyn runs the Grow Indie test gardens in Kutztown PA, and GrowIndie.com, an AMAZING website and resource for all things DIY/organic gardening. Meet Michelle of The Joyful Elephant – Plant Based Nutrition Support. Michelle is a food coach and works with her clients to meet their health and dietary needs through education, hands-on work, and support to help people make a smooth transition into plant-based nutrition. Michelle is certified through courses from two of the top plant-based doctors, T. Colin Campbell (as seen in the film Forks over Knives), and Dr. Fuhrman of the Eat to Live program. Michelle of The Joyful Elephant, and Jaime K of Save the Kales!